Luxury Hampers your executives will rave about! Congratulate them on a successful project or business win. Your team leaders have put blood, sweat and tears into their work. They’ve smashed through project goals and helped your business power toward success. A thank you card and pat on the back isn’t going to cut it. Reward them for their passion and dedication and keep motivation and morale sky high. Just like your executives, our gift baskets are a step above the rest. Our Executive Luxury Hampers are filled with premium products sure to get them talking and send motivation and morale through the roof. When words aren’t enough, a luxury executive gift basket is a sure-fire way to show them you care. We know how to keep staff turnover down, do you? The secret to employee retention is in your appreciation. Your executive team makes or breaks your company – show them they’re appreciated. A strong team makes an unbreakable business. Staff turnover is a crippling cost you can’t afford. Your executive team is irreplaceable. Show them. Treat them with luxury gift hampers that delight their whole family. Show your staff and business partners how much you value them with luxury hampers guaranteed to leave a memorable impression. Whether you’re recognising hard work, celebrating a new partnership, a successful project or simply want to say thanks. 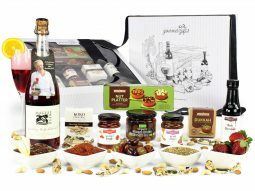 Australian Gourmet Gifts is the best choice for luxury hampers in Australia. Thank your valued clients and keep them coming back with luxury corporate hampers. Filled with premium wines, champagne, gourmet foods and delectable chocolates, our hampers for business are corporate gifts your client won’t forget. A fine selection of handpicked products, beautifully packaged and delivered on time every time, our luxury gift baskets guarantee a professional reflection of your brand. Make your clients and customers feel appreciated with a corporate gift that will blow them away. Working to a budget, but want to deliver the highest quality executive gifts to make an impression that counts? No problem. Australian Gourmet Gifts have luxury hampers to meet your specific corporate budget and business needs to ensure you and your client receive nothing but the best. Better still, we offer free delivery Australia wide and a 10% bulk order discount on all purchases over $1000. Lendlease, Ninemsn, ABC, Westpac and AMP use Australian Gourmet Gifts. You should too! Join some of Australia’s biggest brands in using Australian Gourmet Gifts to help you maintain, strengthen and forge new business relationships. We know what executives look for in a luxury hamper and we ensure we provide only the best products. Our clients, including ninemsn, ABC, AMP and Toll, know that when it comes to hampers for business, there’s no other choice than Australian Gourmet Gifts. Ditch the lame Christmas cards this year and make the ultimate impression with a beautifully packaged luxury gift basket. When your executives or key staff are working long hours, their families are affected too. Show their families that you appreciate their support. While a round of golf or event tickets sound like perfect executive gifts, a gourmet corporate gift basket helps your team to share your appreciation at home. Sweets for the kids, savouries for the partners – a gift basket full of appreciation will be as popular at home as in the office. 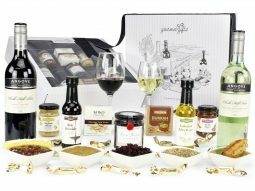 Start browsing Australian Gourmet Gifts for luxury hampers. A true reflection of your business and brand, Australian Gourmet Gifts offer superior executive gifts guaranteed to win over your clients and business partners, and their respective families.